Only funds with coverage >100% are considered! Top lists of discount, yield, D x Y and D x Y x Z are given. A comparison of D x Y x Z metrics to three and six months ago. This article was first released to CEF/ETF Income Laboratory subscribers one month ago, so data may be out of date. Please check latest data before making investment decisions. Quantitative screens help to rapidly narrow down attractive candidates from the database of 500-plus closed-end funds (CEFs) for further due diligence and investigation. Based on feedback from members, it seems that a very many number of investors, understandably, place a great emphasis on coverage and return of capital. While I'm not going to rehash the entire ROC argument here (it is suffice to say that the issue is much more complicated than "ROC = bad"), some investors may consider a fund with over 100% coverage to be attractive simply because they know that the distributions are being covered by earnings. Such a fund may be at lower risk of a distribution cut, which can cause devastating impacts to a fund's market price, and may even afford to raise its distribution in the future. What does the "quality" indicate? Simply put, it means that the distribution coverage is greater than 100%. However, please note these caveats: Firstly, coverage ratios are calculated using earnings data from CEFConnect. While there are sometimes discrepancies with CEFConnect's data, this allows us to automate the calculation process for the entire universe, and I consider it to be sufficiently reliable for a preliminary screen anyway. Before buying or selling any fund, it is recommended to independently verify the coverage ratios from the individual fund annual/semi-annual reports themselves. Secondly, having a coverage ratio >100% does not guarantee that the fund's distribution is secure. Many funds reduce their distributions periodically in line with market conditions in order to maintain good coverage. Thirdly, a coverage cut-off ratio of 100% is, ultimately, an arbitrary number. A fund with 99.9% coverage will be excluded from the rankings, whereas funds with 100.1% coverage will be considered, even though only a sliver of coverage separates the two. I hope that these rankings of quality CEFs will provide fertile ground for further exploration. Data were taken from the close of March 13, 2019. The following data show the 10 CEFs with the highest discounts and coverage >100%. Yields, z-scores and leverage are shown for comparison. CEFs with the lowest z-scores are potential buy candidates. The following data show the 10 CEFs with the lowest z-scores. 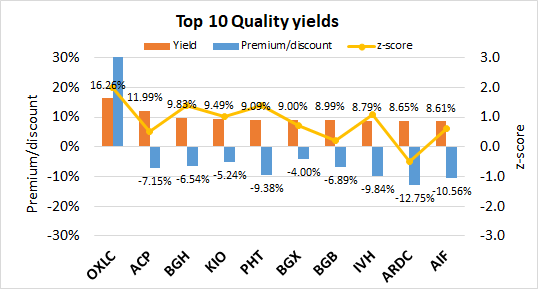 Premium/discount, yields and leverage are shown for comparison. Only funds with coverage >100% are considered. Some readers are mostly interested in obtaining income from their CEFs, so the following data presents the top 20 highest-yielding CEFs. 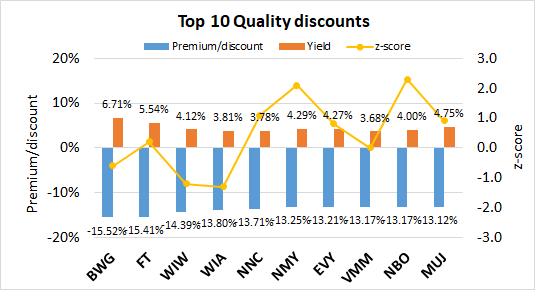 I've also included the premium/discount and z-score data for reference. 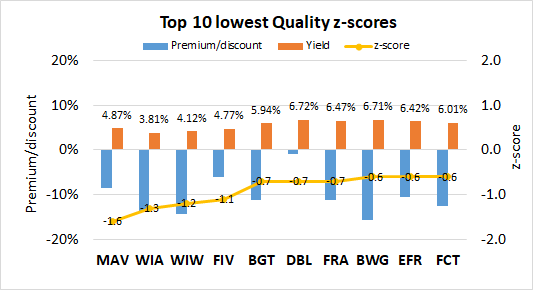 Before going out and buying all 10 funds from the list, some words of caution: [i] higher yields generally indicate higher risk, and [ii] some of these funds trade at a premium, meaning you will be buying them at a price higher than the intrinsic value of the assets (which is why I've included the premium/discount and z-score data for consideration). Only funds with coverage >100% are considered. To make the charts more manageable, I've split the funds into two groups of 10. For possible buy candidates, it is probably a good idea to consider both yield and discount. Buying a CEF with both a high yield and discount not only gives you the opportunity to capitalize from discount contraction, but you also get "free" alpha every time the distribution is paid out. This is because paying out a distribution is effectively the same as liquidating the fund at NAV and returning the capital to the unitholders. I considered several ways to rank CEFs by a composite metric of both yield and discount. The simplest would be yield + discount; however, I disregarded this because yields and discounts may have different ranges of absolute values and a sum would be biased towards the larger set of values. I finally settled on the multiplicative product, yield x discount. This is because I consider a CEF with 7% yield and 7% discount to be more desirable than a fund with 2% yield and 12% discount, or 12% yield and 2% discount, even though each pair of quantities sum to 14%. 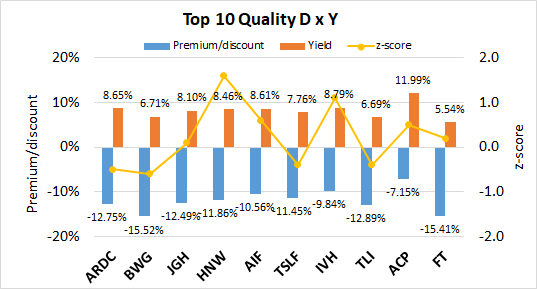 Multiplying yield and discount together biases towards funds with both high yield and discount. Since discount is negative and yield is positive, the more negative the "D x Y" metric, the better. Only funds with >100% coverage are considered. This is my favorite metric because it takes into account all three factors that I always consider when buying or selling CEFs: yield, discount and z-score. The composite metric simply multiplies the three quantities together. A screen is applied to only include CEFs with a negative one-year z-score. As both discount and z-score are negative while yield is positive, the more positive the "D x Y x Z" metric, the better. Only funds with >100% coverage are considered. Take a look at the metrics for the top 10 D x Y x Z list today versus three months ago (December 2018), during the height of the CEF sell-off, and then compared to three months before that (September 2018). The most striking thing is that CEFs are much more richly valued now than in December 2018 (of course), but we are also in more expensive territory than in September 2018 as well, before the sell-off truly went on its way. For example, in September 2018, all 10 CEFs in the top 10 D x Y x Z list had z-scores under -1, while today only three CEFs have that valuation. The average discount of the top 10 candidates today is -12.17% vs. -13.09% six months ago (and -15.49% in December). All of data is just to reinforce the message that we've been giving recently, which is that CEFs are getting back into fairly valued territory as a whole, and we already see pockets of overvaluation sprout up here and there. One should therefore be more judicious with new buys, and consider opportunities to trim overvalued holdings in order to harvest some nice capital gains that can be redeployed to further boost the income stream. In the members section, we provide specific commentary on the top ranked funds and discuss whether they deserve a place in your income portfolio. We're currently offering a limited time only free trial for the CEF/ETF Income Laboratory with a 20% discount for first-time subscribers. Members receive an early look at all public content together with exclusive and actionable commentary on specific funds. We also offer managed closed-end fund (CEF) and exchange-traded fund (ETF) portfolios targeting ~8% yield. Also, check out our 5-star member reviews.